Any plans for a UFC event in Liverpool in the first quarter of 2018 appear to have been put on ice. Last week, UFC president Dana White told an audience at a Q&A in Santa Monica, California that the UFC were planning to move their Feb. 24 event from Orlando, Florida to Darren Till’s hometown of Liverpool. White added that the plan was for Till to fight Stephen “Wonderboy” Thompson, but just hours later, Thompson’s team moved to dismiss the rumour stating that they had no intention of accepting a fight with the Liverpudlian. To add to the confusion, British promotion Cage Warriors had already announced weeks before that they had booked the Liverpool Echo Arena on Feb. 24 for their Cage Warriors 90 event. White’s comments got the UK fans dreaming of an unprecedented two UFC fight nights in under a month with the promotion’s return to London already announced for March 17. Unfortunately, sources close to MMANytt.com earlier this week revealed that the UFC’s plans to move the Feb. 24 show to the Echo Arena had cooled and that news was confirmed last evening by Lance Pugmire of the LA Times. Some updates from @ufc … Feb. 24 is definitely on for Orlando. 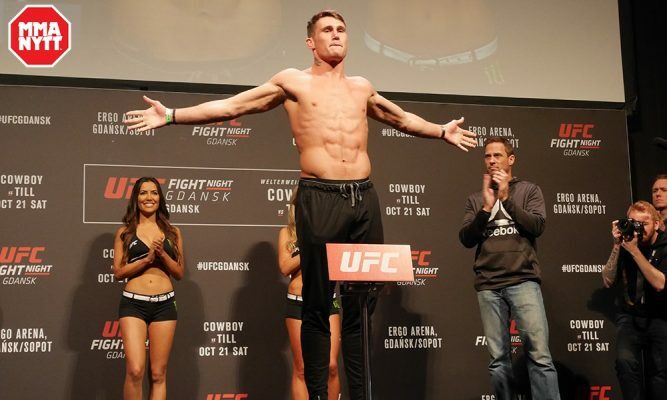 Main event is TBA…and while the desire is to place @darrentill2 in Liverpool next (date TBA), “Wonderboy” Thompson sidelined by UFC 217 injury. While the plans for a UFC event in Liverpool have been iced for the minute, the Liverpool Echo Arena have confirmed to us today that the venue is still booked by Cage Warriors 90 event. Pugmire also confirmed in his update that the UFC will host the Feb. 24. show in the originally announced venue in Orlando. No main event has yet been announced, but Pugmire also noted that the UFC do still intend to match Till against Thompson. The intent is to place @darrentill2 against Wonderboy, the matter of establishing how long Thompson will be out has to be established. Till, however, seems to have set his sights elsewhere and yesterday he went back and forth with Kamaru Usman on Twitter. Given the rumours surrounding Tyron Woodley and the next challenger for the UFC welterweight title, things could be getting very interesting at 170-pounds over the coming days.